Recently described as ‘an extraordinary violinist’ by the UK’s Independent newspaper, Cork born Una Palliser is one of the most eclectic virtuoso string players in the UK. Classically trained at Cork School of Music she is 1st class honours graduate of the Royal Academy of Music London, Una is best known for her unique versatility, mastering and combining classical, trad and Balkan styles. This led to an invite by Colombian artist Shakira to perform as the featured solo violinist on her 14 month stadium world tour where she also doubled as backing vocalist and multi instrumentalist. Una has also featured as soloist with the Manchester Camerata Orchestra, Slovenian Symbolic Orchestra, on tours with Take That, Moby, Gnarls Barkley, Patrick Wolf, George Michael and is currently solo violinist with Leona Lewis. She was the recipient of the RAM Wolfson Trust award, Royal Philharmonia Martin Musical Scholarship, was a string finalist in RTE Musician of the Future Competition and has appeared on many film soundtracks including Peter Jackson's The Lovely Bones. Una's haunting voice has been featured on the Specsaver's 'sheep' advert for the last 4 years with her arrangement of Mo Ghile Mear and she has sung with Elbow on Jools Holland's BBC show. 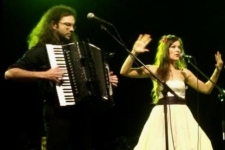 Her band Una and the Balkan Bears made their debut at The Fiddle Fair, Baltimore in 2010 before embarking on an acclaimed Irish / UK tour including a sold out Ronnie Scott's performance in London. Una is currently working on her solo debut album, due for release at the end of 2013. 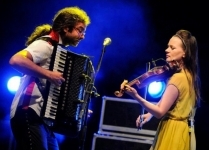 Una met Slovenian accordionist Marko Hatlak through his band BBC World Music Award Winners Terrafolk with whom she has been performing as guest singer/violinist for the last 9 years. Together they had a number one radio hit in Slovenia and Una later invited Marko to play with her band Una and The Balkan Bears in the UK. A distinguished soloist in his own right, Marko graduated from the Liszt School of Music in Germany, later completing postgraduate at Würzburg Music School . He has appeared as soloist with the Moscow Philharmonic Orchestra, RTV Symphonic Orchestra Slovenia and Carmina Slovenica choir and has recorded three solo albums: 'History' works by Astor Piazzolla, 'Music for Accordion', and 'Musical Offering' dedicated to Bach. He is also founding leader of Funtango performing much South American music throughout Eastern Europe.